Graceland’s third Chancery Court action in less than a year was its most anticipated. Elvis Presley Enterprises filed a complaint in Shelby County Chancery Court June 29 seeking a declaratory judgment on whether its plans for an arena in Whitehaven violate the noncompete agreement city and county governments have with the part of the Memphis Grizzlies that runs FedExForum for both local governments. The complaint comes after two earlier lawsuits were dismissed in Chancery Court, the last one because the city-county Economic Development Growth Engine (EDGE) hadn’t made a decision on Graceland’s request. Then EDGE and the Shelby County Commission each approved basically the same resolution that gives limited approval to Graceland’s plan. The Memphis City Council has not voted on such a resolution to date. The limit or condition on the resolution is that it hinges on a court ruling that states the arena would not compete with FedExForum by the terms of the arena use agreement including the noncompete clause. “Without question, the Arena Use Agreement unequivocally and directly authorizes the city and the county to encourage, provide support for and approve private projects like the Graceland Project,” reads the complaint seeking a declaratory judgment. City chief legal officer Bruce McMullen said in a June 11 written statement that the stage was set for a third move to court and a court decision. 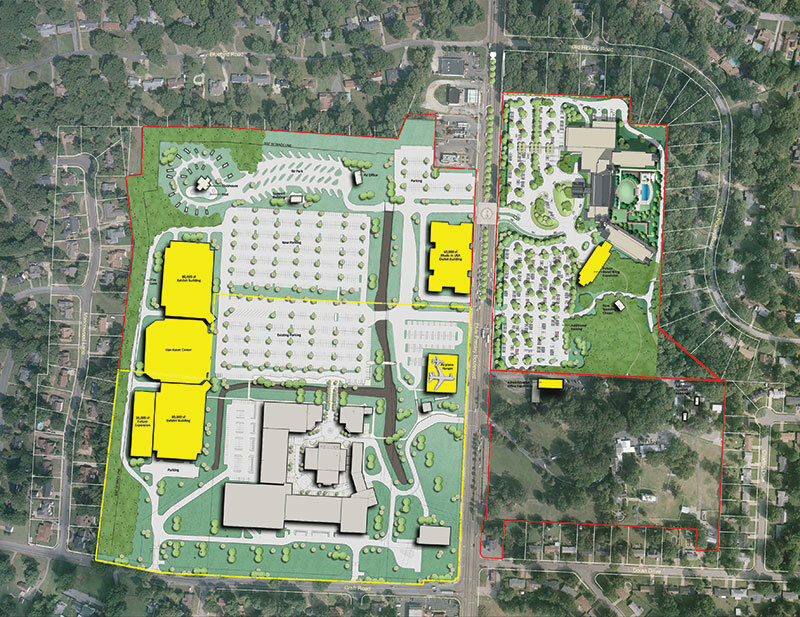 Graceland, through attorney Clarence A. Wilbon, claims the city and county approved the arena when each approved a general plan for campus expansion, including upping Graceland’s draw on property tax revenue generated on the campus from 50 percent to 65 percent. Parts of the Graceland plan included the Guest House at Graceland and Elvis Presley’s Memphis, both now open. But it wasn’t until Elvis Week last August that Graceland Holdings managing partner Joel Weinshanker talked specifically about a 6,000-seat arena as part of the plan. Since then, the arena plan has changed in scope. There was a version with fewer than 5,000 seats. There was a convention center with an even lower seat count and then there was a convention center with an arena next to it with 6,200 seats. The key change by Graceland’s view is that it would use the increase in property tax revenue with a 65 percent share of the TIF – tax increment financing – going toward the ongoing financing of the debt from Guest House and Elvis Presley’s Memphis and use its own money to pay for building the arena. The distinction is essential to Graceland’s argument in court and is built on a part of the noncompete agreement in the city and county agreement with the Grizzlies to manage the forum that comes after section 21. Section 21 is the part that mandates city and county governments cannot finance any fixed-seat arena of 5,000 or more seats as long as the Grizzlies manage and operate FedExForum including absorbing any financial losses in the operation. Memphis Mayor Jim Strickland has dismissed that version saying it amounts to an arrangement on paper that still constitutes city and county government funding for a competing arena in violation of the non-compete. He has also said the city is unwilling to agree to increase the flow of city property tax revenue to Graceland because the city needs the revenue to provide basic core city services.